Hello Advent and paper crafting fans! I’m excited to be part of Taheerah’s grand event for the third year, and thrilled to have found a new stamp company as a result! If you’ve been following along this season, or the last few years, you know that each day there are sponsors and gifts to be had, and it is the season for giving! So on with the show! Advent Calendar Extravaganza is -the- festive event of the season! This ‘hop with a twist’ was dreamed up by Taheerah Atchia and features surprise destinations each day! Joining in the fun with Taheerah are ONE HUNDRED special guests – each serving up some fantastic Christmas inspiration! Just like an Advent Calendar, you’ll never know where you’re going to be visiting next until you ‘open the door’! And that’s not all! With 25 *amazing* sponsors taking part as guests as well, your crafty wish list is bound to get a boost with a chance to win a prize EVERY SINGLE DAY!! Join in the fun every day at taheerah-atchia.com to see what special surprises await behind the door! Our sponsor today is The Stamp Market, a company that speaks to my modern and graphic heart! I’ve used three of their products for today’s pieces and will soon feature more holiday and packaging goodnesss from them, so check out my instagram for updates! First up, a dynamic duo with one with alternative holiday colors– perfect for someone who lives in Hawaii or is having a tropical Christmas. I stamped so many of these flowers from the Botanicals Stamp & Cut set, playing with a variety of pinks and reds, so it became the focal point of all my designs. My card also features the large Stemmed Leaves Die cut from gorgeous green bokeh paper. This die mirrors the stamped leaves in the Botanicals set. Finally, the sentiment is part of the Holiday Hellos set, which is a fabulous mix of graphic lettering and sentiments for many occasions. Here I stamped the Merry on thick linen vellum and heat embossed, then fussy cut. Since it is an advent extravaganza after all, I decided to wrap these cards up in Neat & Tangled’s lacy envelope die which takes any card to the next level. What’s behind door number two? This version features more traditional colors and a bit of a retro feel. The Botanicals set comes with a die to cut the flower, so I added a vellum layer over the stamped image. Again I’ve included the large Stemmed Leaves die cut. I included this close-up so you could see the gorgeous shimmer of the red paper on which I stamped and heat embossed a sentiment from Julie Ebersole’s Modern Christmas, available through Ellen Hutson (as is the #110 Woodgrain Cardstock I feature in many of my pieces here). For my final two pieces, I created some wine tags, as I recently had booths at an art show and night market here in Seattle. Holidays are a time for bubbly and fine festive drinks, alcoholic or not, so why not adorn a bottle at your table or as a gift! I love this wine tag die which is quite old and no longer available. Thank so much for stopping by to see what was behind the door today! But before you go– remember to comment! It’s not a party without a prize – and with prizes every day there are several chances to win! Today’s prize is generously supplied by The Stamp Market so you’ll definitely want to win! How to win? Simply leave a comment on my post – then head back to taheerah-atchia.com and leave a comment there too! You must leave a comment on Taheerah’s blog as well as mine in order to be eligible to win! Don’t forget to grab the other surprise destinations from Taheerah’s blog and head over to them to leave comments there as well to improve your odds even more! You have until 23:59 EST on 31st December 2017 to enter. The Advent Calendar Extravaganza runs from 1st-25th December inclusive, so make sure you visit taheerah-atchia.com every day for fabulous inspiration and amazing prizes every single time! A merry season to all who celebrate a variety of holidays or in various ways this time of year– wishing you a peaceful, reflective and artful time! And a Happy New Year, too! Well, it’s October again, and there are only 3 months left in 2017! Depending how you look at it, this might be a good thing, as 2017 has been a pretty rocky, surreal ride for many, many people. Halloween may just pale in comparison this year! I’m always under the spell of adorable harbor seals– my favorite marine mammal!! I think our Puget Sound seals and those along the CA coast need to cast a serious spell over the transient orca pod here and the increasing white shark population in California waters, both of whom are enjoying the sweet, solitary butterballs a bit too much (in my opinion) this year! Here I stamped the LF Sealed with a Kiss seals and then Copic colored them, drawing the Dracula hair and fangs, and stamping their eyes. The LF candy corn were also Copic colored and fussy cut. The background was stamped in Hero Arts neon green dye ink with Concord and 9th’s Lacy Leaf abstract stamp, and I love how it looks like a green, ghostly (ghastly?) gas!! Kind of like the state of our Puget Sound at this time of the year!! I added a few additional Jolie’s Boutique candy stickers, a witch hat brad, and Michael’s Recollections sentiment sticher, and finished the inside with some bat washi. Now what tricks do you have up your sleeve? We can’t wait to see how you weave our challenge this month into your creation! Leave us spellbound! Tonya, of The Heart Desires store fame, is having a birthday today!! I hope she is enjoying the gorgeous fall day & weekend the PNW has presented us!! To celebrate her day and the season, I created an autumn card featuring Kaisercraft & Essentials by Ellen Leaves, and Altenew letters. The cross-stitch die can be found at The Heart Desires. Love the Gina Marie dies Tonya carries! The leaves were die cut from stamped cardstock. 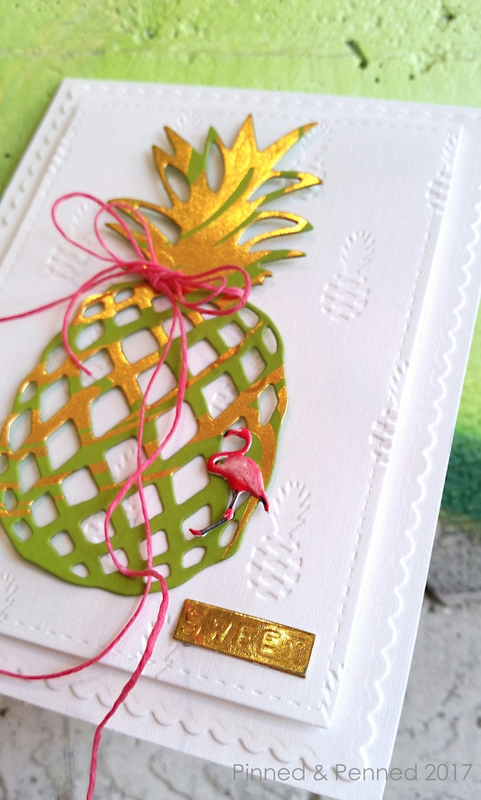 I used gold cardstock from Essentials by Ellen for a shimery, rich base. Inside finished with washi! Make Tonya’s day by wishing her the best year ahead and mayylbe picking up something from her store! She has some great new arrivals! Hi Everyone and welcome to The Heart Desires Challenge for September! Fall is just around the corner, though I’m not quite ready to make the transition. How about you? Most Seattlites struggle with 80 degree days and yearn for the cool and rain– not me! I love the seasons, but struggle with transitions, and frankly summer is always snatched away too soon. The older I get, the grumpier I get when summer comes to an end! We’re also experiencing some pretty gnarly weather in Seattle due to numerous wildfires around Washington and in Oregon. Last night’s full corn moon was red again and our sun has been a neon pink orb the last few days as the ash and smoke hang in the air and cover homes, inside and out–more fall cleaning! It’s pretty surreal– an odd natural beauty born of disaster, lightning, a changing climate, and human carelessness. Certainly many places around the globe are experiencing difficult, and disastrous, seasonal transitions as well. Change is challenging no matter how or when it happens! 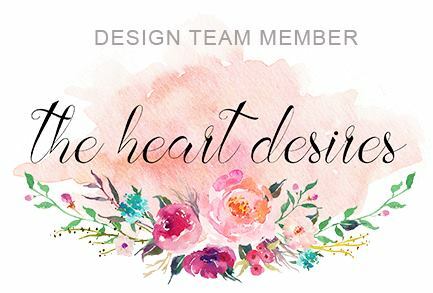 So why not head over to The Heart Desires where change is good and our challenges are more fun? The colors, patterns, and my thoughts of Central California Coast, where I traveled this summer and where life is all about the beach and surfing, particularly in and around Santa Cruz and Big Sur all influenced my design. How I’d love to own or rent an Airstream or Vanagon and just live for a month or two traveling up and down the coast! I created a fall duo with the Flora & Fauna Camper set and Carta Bella’s Autumn & Jen Hadfield’s Warm & Cozy papers, available at The Heart Desires store. The Warm & Cozy papers are perfect for making these little epoxy buttons. I used the Concord & 9th Layering Leaves Die to create my “surfboard” cut from cherry wood veneer. The wheels were cut twice to create the silver rims, and then I used Matte Sprinkles for the tires. The envelope die isn’t available at the Heart Desires– it’s an exclusive Neat and Tangled product, but it makes the best wrapper for pretty much every card. Finally, the inside is finished with some ombre aqua washi, reminiscent of the ocean & echoing the tires on the bus! You might also note that the blue of the table in the challenge picture also inspired the use of this color– aqua and orange are such an amazing combo! Since I’m posting this feature a day late, I’m also over on the Heart Desires blog today, Thursday, with another card featuring the Flora and Fauna Camper! Head over there and learn more about it! That’s it for me! Here’s to smooth transitions, happy trails and good vibes! PNW friends are hopping once again, this time for Amy Tsuruta! Lovely Laura Norris is our hostess and I’m the last stop, but you can check below for the hop order! Our challenge was to create a card with green, Seattle, or coffee. I chose green as my focus, and because I was traveling and had three blog posts to write during that time, I brought my cards along, and for Amy I did the photoshoot in a San Francisco coffeeshop! 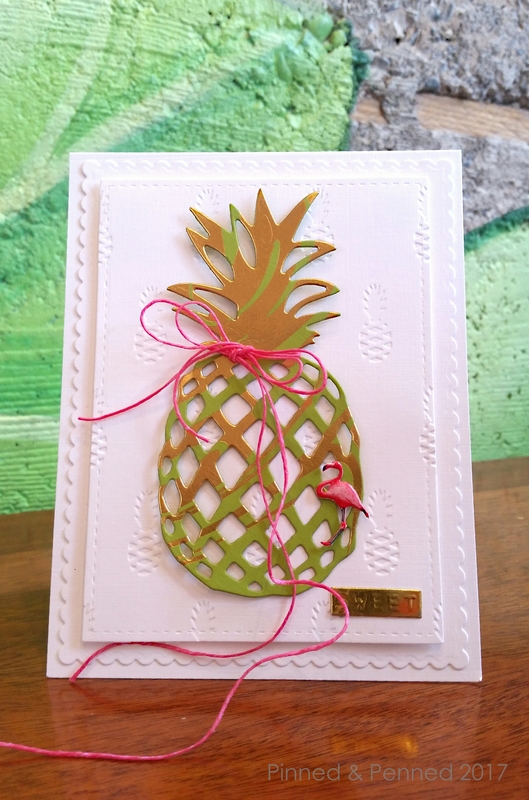 Amy likes pineapples so I created a very clean card with the Pink Paislee pinapple embossing folder and Kaisercraft pineapple die cut from green and gold Bazill paper. Pineapples are sweet and so is Amy! Hoping she has an amazing day filled with friends, family, some crafting and of couse, coffee! 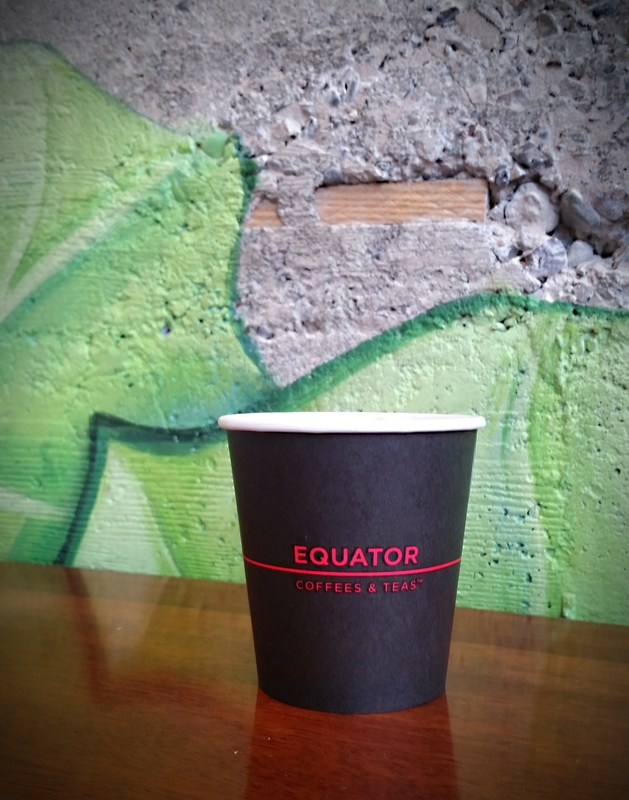 Equator on Market in SF is a great choice for healthy eats and their single origins, as well as some great art. Just down the street you’ll find Mazarine who features Ritual coffee and Linea roasters. Love their decor and single origin options. 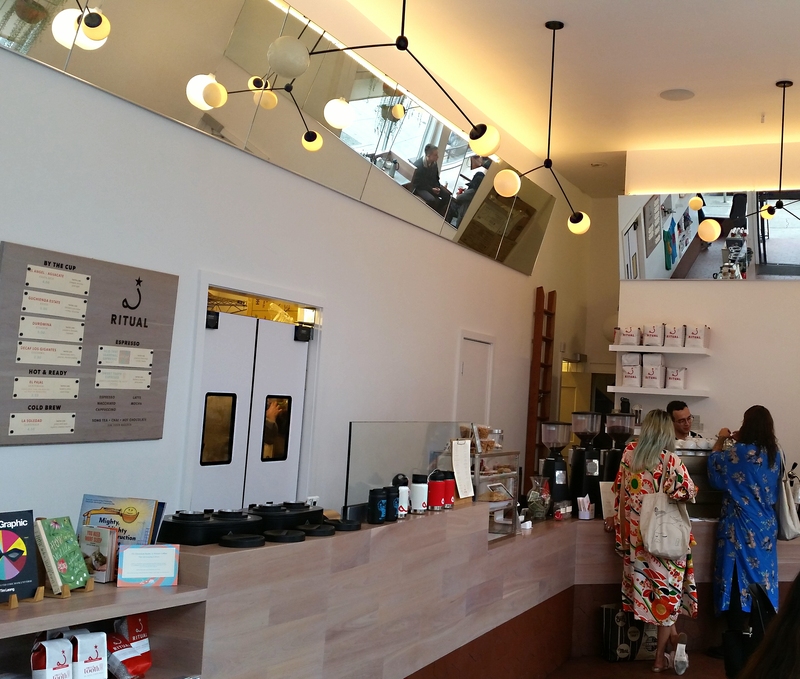 We also visited Ritual in the Haight, a super modern, friendly and delicious choice! But I saved the best for last: Sightglass in SOMA. Amy you’ll love the affagato bar! 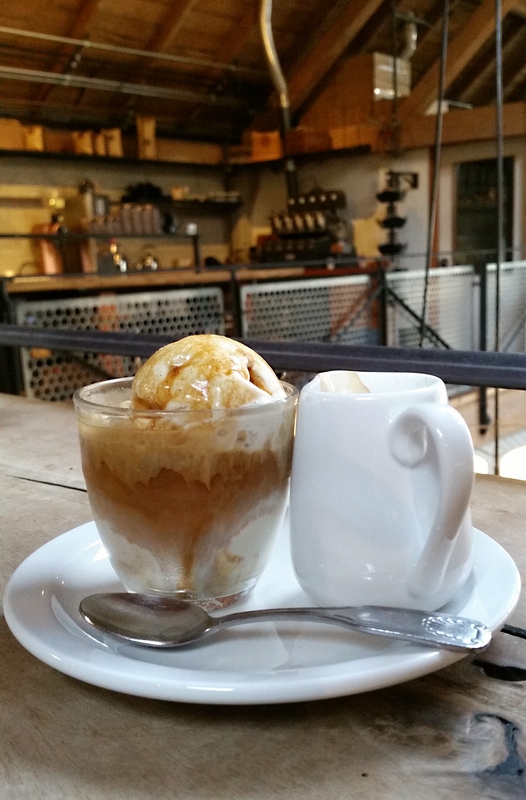 Single origin Colombia espresso over Salt & Straw vanilla ice cream! 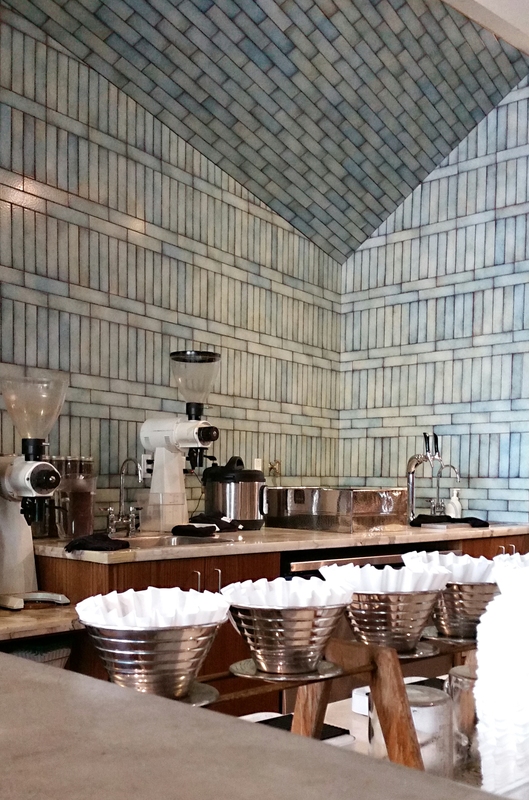 Want to know where these are located and 20 more must-visit coffee shops in SF? See this Eater article! Happy travels, happy drinking, and….